Antimicrobial resistance limits traditional treatment options and increases costs. It is therefore important to estimate the magnitude of the problem so as to provide empirical data to guide control efforts. The aim of this study was to investigate the burden and patterns of antimicrobial resistance (AMR) among equine Staphylococcus samples submitted to the University of Kentucky Veterinary Diagnostic Laboratory (UKVDL) from 1993 to 2009. Retrospective data of 1711 equine Staphylococcus samples submitted to the UKVDL during the time period 1993 to 2009 were included in the study. Antimicrobial susceptibility testing, that included 16 drugs, were performed using cultures followed by the Kirby-Bauer disk diffusion susceptibility test. The proportion of resistant isolates by animal breed, species of organism, sample source, and time period were computed. Chi-square and Cochran-Armitage trend tests were used to identify significant associations and temporal trends, respectively. Logistic regression models were used to investigate predictors of AMR and multidrug resistance (MDR). A total of 66.3% of the isolates were resistant to at least one antimicrobial, most of which were Staphylococcus aureus (77.1%), while 25.0% were MDR. The highest level of resistance was to penicillins (52.9%). Among drug classes, isolates had the highest rate of AMR to at least one type of β-lactams (49.2%), followed by aminoglycosides (30.2%). Significant (p < 0.05) associations were observed between odds of AMR and horse breed, species of organism and year. Similarly, significant (p < 0.05) associations were identified between odds of MDR and breed and age. While some isolates had resistance to up to 12 antimicrobials, AMR profiles featuring single antimicrobials such as penicillin were more common than those with multiple antimicrobials. Demographic factors were significant predictors of AMR and MDR. The fact that some isolates had resistance to up to 12 of the 16 antimicrobials assessed is quite concerning. 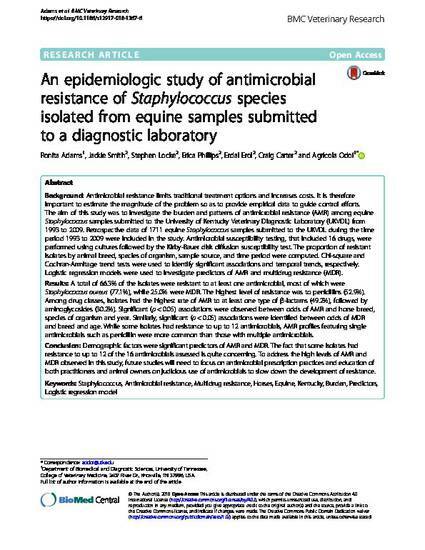 To address the high levels of AMR and MDR observed in this study, future studies will need to focus on antimicrobial prescription practices and education of both practitioners and animal owners on judicious use of antimicrobials to slow down the development of resistance.